When four years ago Wikileaks published 250,000 US state department cables dating back to the 1960s, a believer in ET visitations asked why, in the great mass of data, there was not one major UFO secret. Soon afterwards, during a live Q&A, Wikileaks supremo Julian Assange explained that ‘many weirdoes email us about UFOs’ but none of the stories they supply satisfied their twin publishing criteria, which was: ‘that the documents not be self-authored; that they be original’. Now former NSA contractor Edward Snowden has upped the ante with a massive leak of two million top secret documents. Snowden’s leak to The Guardian and New York Times has been described by Daniel Ellsberg of Pentagon Papers fame as ‘the most significant leak’ of classified material in US history. Yet Snowden’s revelations have failed to produce the ‘smoking gun’ that would prove the alien presence on Earth, the real ultimate secret if you buy into the UFO myth. Even if you don’t it cannot be denied that if such knowledge really existed it should merit at least a tiny reference in the files of the world’s most powerful intelligence agency. The revelation that flying saucers have landed and governments are in contact with alien intelligences would make the ongoing debates about mass surveillance and the balance between national security and information privacy seem like an afterthought. So far not a single authentic piece of paper, memo or PowerPoint has emerged from either Wikileaks or Snowden-gate to support this widely held modern myth. The UFO industry has struggled to explain this odd omission and its corporate arm, the so-called ‘exopolitics’ movement led by the Paradigm Research Group, has continued on its merry way organising mock congressional hearings as if nothing in the world had changed. 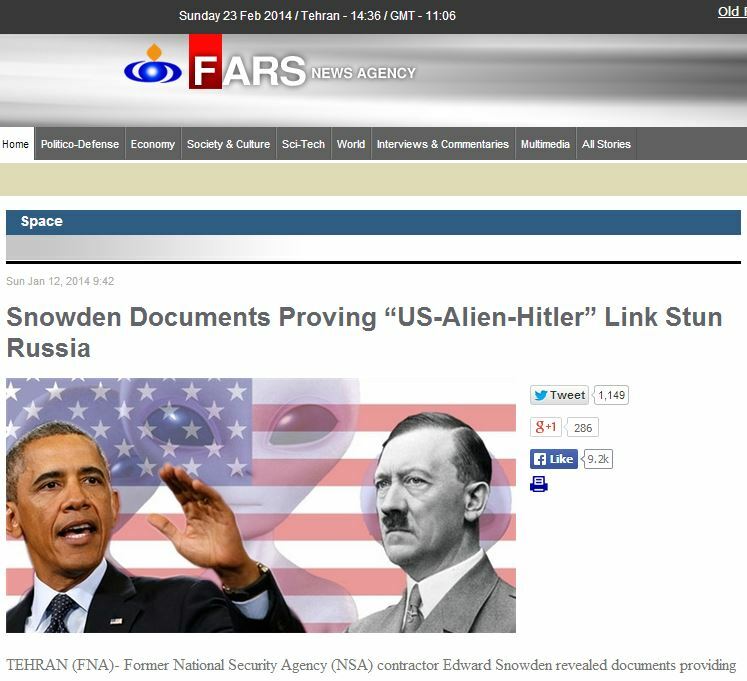 Then, early in the new year someone decided it was time to stitch the breaking Snowden story together with the UFO conspiracy rumours. 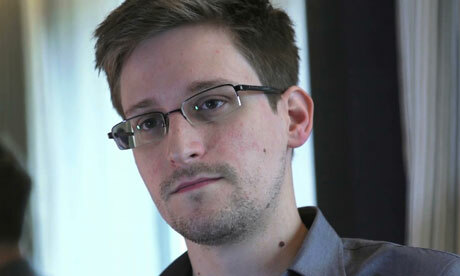 Snowden fled to Russia in June 2013 and has been granted temporary asylum. In January what the Washington Post describes as ‘an ultra-fringe conspiracy website’, www.whatdoesitmean.com published a story based upon what it claimed was a FSB dossier summarising NSA secrets handed over to the Russian security service by Snowden. The author of this piece, one ‘Sorcha Faal’, claimed its contents provided ‘incontrovertible proof’ that ‘an alien/extra-terrestrial intelligence agenda’ is driving US foreign policy. The dossier said the US government has been secretly run by a ‘shadow government’ of extra-terrestrials since the Second World War. No good UFO story is complete without a Nazi element so the hoax included the ‘fact’ that Hitler built up his U-boat fleet ‘with alien assistance’, updating the familiar ancient astronauts meme to WW2. According to the story, after backing the wrong side in WW2 the aliens are now holed up at Area 51 with President Obama as their willing dupe and are plotting to use the omnipresent NSA to take over the world. Hoax documents have always been a favourite trope in UFOlogy and the fake MJ12 papers, offered as proof of the Roswell incident during the ‘80s, provide a useful template. Further evidence? Sorcha Faal is so obviously a made-up name and whatdoesitmean is a notorious source of fake stories. Only the gullible or credulous were likely to pay any attention to nonsense published on ‘an ultra-fringe conspiracy website’. But some have grounds to suspect it is run by someone spreading disinformation on behalf of one or more intelligence agencies. It is equally possible that ‘Faal’ is simply having fun by publishing nonsense that he or she knows will be swallowed by those want to believe it. If there is any truth in the disinformation theory, on this occasion the spooks scored a direct hit. Soon after its appearance ‘the semi-official Iranian news agency’, FARS, swallowed the hoax whole. On 12 January Fars published a breathless regurgitation of the FSB story, faithfully referenced to its source: whatdoesitmean.com. They also repeated Faal’s claim that the contents of the Russian dossier had been confirmed by the former Canadian defence minister, Paul Hellyer, during a live interview on Russian TV on 30 December 2013. The 90-year-old, FARS claimed, had been consulted by the FSB during his Russian trip on the accuracy of the alien story. Hellyer’s faith in aliens includes his claim that ‘at least four species of aliens’ have been visiting Earth for thousands of years. These include ‘Nordic blondes’ and Tall Whites that live on earth ‘and are working with the United States government’. So far so weird. Hellyer can’t provide any proof, but neither could Lord Hill Norton or any of the other cranky ‘top people’ who have swallowed the wilder products of the UFO industry whole in their dotage. But in this case Hellyer, by talking about ‘Tall Whites’ and aliens secretly running the US government since the ’50s, played right into the hands of the person or persons responsible for concocting the Nazi alien hoax. Both Hellyer and Disclosure spokesman Stephen Bassett have since published disclaimers, blaming what they believe is a CIA plot to smear them. In this case they may be right. The spooks have form in using belief in UFOs and other fringe phenomena to discredit politicians and other targets. In 2001, the renegade SIS officer Richard Tomlinson claimed that during the run-up to the 1992 elections for the UN Secretary General, the CIA ran a smear campaign against the Egyptian candidate, Boutros Boutros Ghali, who they claimed ‘was a believer in the existence of UFOs and extra-terrestrial life’ (The Independent, 1 June 2001). The smear was allegedly run by planting false stories in the media, much as Sorcha Faal tries to do.This operation failed as Boutros-Ghali was elected. But in the Fars case it seems to me that Hellyer and the UFO believers were roped in as cannon-fodder. The real target is Snowden himself and the intention is to portray him as unbalanced and a traitor who passes secrets to the Russians . According to Luke Harding’s 2014 book The Snowden Files his haul of NSA documents is protected by several layers of sophisticated encryption and has not fallen into the hands of his hosts. I have to agree with Max Fisher of the Washington Post, who described this hall of mirrors as ‘highly entertaining’. And until new information emerges I await a convincing answer to the question I posed in 2010: ‘where are the UFO whistle-blowers?’ Sorry, Paul Hellyer doesn’t count. This entry was posted in Uncategorized and tagged Boutros Boutros-Ghali, CIA, Daniel Ellsberg, Disclosure, Edward Snowden, Fars news agency, FSB, Iran, Julian Assange, Lord Hill Norton, Max Fisher, MJ-12 hoax, Nazi aliens, New York Times, Nordic blondes, NSA, Paradigm Research Group, Paul Hellyer, Richard Tomlinson, Roswell, Sorcha Faal, Stephen Bassett, Tall Whites, The Guardian, The Pentagon Papers, The Snowden Files, The Washington Post, UFOs, whatdoesitmean.com, Wikileaks. Bookmark the permalink. Hi David Paul Helleyer has been, how shall we say, “eccentric” for years before getting involved with UFOs. He was a member of, an ran for the leadership of, both the Liberal Party and the old Progressive Conservative Party, formed two of his own; Action Canada and Canadian Action Party, and tried to join the third New Democratic Party (ie Labour). His politics have ranged from the Thatcherite right to the anti-globalisation left, and has always had a touch of Social Credit. He now seems to be the perfect symbol of fusion paranoia. Maybe Snowden is holding files to strike a deal with the US authorities to not actually keep pursuing to find him and kill him. Maybe ALIEN on military videos are nothing but some kind of result of human experiments. The genetic engineering and underground experiments related to it have been going on for decades i believe in human history. And the reason why they need aliens to exist and portray the result of these experiments with high technology involved is that it will be the reason for a third world war to consolidate the “one world government” by these few powerful, as a common enemy to earth needs a common effort by all. Or maybe alien exist, which i personally believe in, looking at the size of this universe and wondering that these stars must not put up in space for our visual delight. This is an infinite place and we’re an infinitesimally small part of it. We might just be the creation of a biological evolution on this habitable planet and the planet will shake us off the moment it likes looking at its past deeds. SO , just enjoy your time here, drink beer ! Cheers ! Aliens do exist and if you really want to discover what both Paul Hellyer and Edward Snowden are saying and hiding you should read the novel Binoetics: First Touchdown (www.Facebook.com/Binoetics). The extraterrestrials that Hellyer and Snowden refer to as Tall Whites are actually called Esseliens according to the author of Binoetics. Both Hellyer and Snowden independently confirmed what he revealed in his book that these extraterrestrials (Esseliens) had helped Nazi Germany’s rise in the 1930’s. He revealed this forbidden knowledge in his novel years before Hellyer and Snowden came up with their revelations. There is more to the novel, but it will be up to you to judge. The world is not the way it appears to us and sometimes truth is stranger than fiction. Hi David! Have to agree with you on this one. To be quite honest, I did buy into the whole UFO saga and spent endless hours watching and re-watching UFO related videos. I couldn’t wait to read the latest articles on offer and used to think that sceptics were largely making a living as debunkers. Then one day, not so long ago, I took a step back and decided to review what was being presented from a skeptical point of view. I suppose it was the plethora of militarily related witness accounts and the reports of crashed or landed vehicles that got me to wondering if perhaps we were all being double-bluffed. You see, I have no doubt that people have, and still are, seeing and capturing extraordinary and enigmatic craft. I also believe that there have been retrievals that have involved ultra-security and disinformation. However, by combing back through much of the UFO timeline, it now seems obvious to me that what we have been observing are ours. I think that there has been a natural evolutionary progression in observable design and performance of these craft since the 1930’s/40’s, which I find very odd. Furthermore, it is now my belief that blankets of “evidence”, and deliberately weak official denial, have been designed to create a psychological, mass normalisation of, at least, the plausibility of belief in “aliens”. Doesn’t everyone take official-speak with a pinch of salt, especially with our propensity for believing, at least a little, in folk-lore? How else could the secrets behind the propulsion and stealth capabilities of man-made technology and massively, overt testing missions, be hidden in plain sight and not give the game away. My hypothesis is that Roswell did happen. It was ours; possibly a failed test flight gone wrong. I think that other verifiable landings/crashes were also ours. The fact that there are immensely powerful actors involved in every aspect of the global financial and industrial system, brings me to believe that the path to abundant and clean energy has long-since, been found and harnessed. This is the world’s most guarded secret and one not to be shared, for if it were, these manipulators would lose their power and their monopolies over the whole world. It could not be allowed to happen. They have already plotted for tomorrow but I fear the common man may be in for a very tough future. This is just my informed take on what’s going on, but as previously stated, if I can be disproved with a satisfactory alternative and an explanation of what is evidently in our skies, I could alter or change my conclusions. This is a spurious argument. How can you pretend to be wise in the ways of the world and yet ignore the reality that it would be suicide for snowden to leak any fringe document. I can assure you even if he had a dozens of files regarding the following topics…UFO’s, CIA helping to set up crack in LA, Extreme global warming studies, JFK assassination data, etc etc. he would never be so stupid to release them. Anything fringe would be carte blanche to dismiss everything important he was doing. You even point out the only smearing going on is towards Snowden but then you expect him to give ammunition that he is a crazy conspiracy idiot and his releases are full of false data?. I agree whole heartedly about basset and helboy and I am not even saying there IS a conspiracy or that Snowden has any ufo files…just that the initial premise of this article is disturbingly naïve. Also, for the record, if you want to spread the proper perspective about Hellyer, please just do the research and inform people that in a parliamentary system, the defense minister post during a time of very deep peacetime is only slightly more prestigious than being appointed head dogcatcher. Especially in Canada, And no offence, but attempting to make Hellyer and Lord Hill Norton comparable men is sloppy at best and a disrespectful piece of manipulation at the worst. After reading the article I’ve concluded that stories with infinite life spans are the death of Adolph Hitler, the NAZI Party and proof of extraterrestrials and their flying machines. With due respect to the author of the article I wonder if I should be concerned about my sanity having “clearly” observed a whatever it was and should I be concerned about the vast numbers of others who have claimed to observe whatever they are. It may be that we are all going nuts. Most amusing is the fact that our government has not issued a firm positive or negative statement on the subject leaving all to wildly speculate which in the end could be costly. Imagine an official alarm that “we are being attacked” with an overall response of “so what”. Not sure why you would expect there to be mention of aliens within the programs Snowden was involved in. With regards to whistleblowers, for one thing I wouldn’t expect there to be nearly as many people involved in programs involving aliens as there are in programs relating to surveillance and foreign policy. You ask ‘why [I] would expect there to be mention of aliens’ within the programs Snowden was involved in. At the time I wrote this blog-entry there was no evidence, so you might have a point. But not evidence of aliens, evidence of manipulation of the UFO myth for intelligence purposes. I’ve seen plenty of very strange phenomena as I enjoy camping and star gazing. But I’ve never seen anything to suggest they are spacemen from another planet.Something very strange is going on and I’ll swear to it and be in no peril at all, but I will not jump to unsubstantiated conclusions. Keep an open mind tempered with integrity and conscience people.The things I’ve seen are not everyday events trust me, and it is as dishonest to say you know it is all bunk as it is for me to say I know definitely what they are. Get out and look up. It won’t take too long to surprise yourself and accustom the palate to humble pie. No intelligence myth in what I’ve seen, on my oath, but it could very well be holographic and/or high technology from earth the public is not a party to. Back in the very early 70s, when I was just a kid of about 8-years old, I was outside playing on a very warm summer night with a bunch of neighbourhood kids ranging from my age, right up to 16-year olds. It was about 10:00pm and we were getting geared up to play a game of hide-n-seek. I was out this late because my parents were out and my brother was ‘babysitting’ me and playing, too. As we stood around in a circle, determining who was going to be ‘it’….”Bubble gum, bubble gum in a dish, how many pieces do you wish…”, I looked up and just above the rooftop of the neighbourhood houses, was something I will never forget. We all just stopped and stared in awe. What we saw was a huge, disc-shaped ‘thing’, which was entirely lit up in a fluorescent orange colour….it just….glowed. You could not see any light bulbs or determine specifically where the light source came from. It just glowed like a hot coal. As it hovered above the roof, there was absolutely NO sound emanating from it. None. It hovered for about thirty seconds before it very slowly ascended a few feet upwards and then slowly….glided, I guess you could say….to the left. A few of us ran after it, to see where it would go, but then it shot away with such speed we were dumbfounded. Contrary to what people might think, not one of us was fearful of this thing. The entire time this ‘thing’ hung in the sky, there was never any noise emanating from it. I was standing in the driveway of the house it hovered over, so I got a pretty good look at it. I’ve never seen anything like it to this day concerning any weaponry or aircraft ANY government claims to possess, nor have I ever seen anything like it in the skies. It does, however, look very similar to SOME video I have seen purported to be that of UFOs. I share my experience here not because it matters if strangers believe me or not, but to add to the list of everyday, sane people who have seen something amazing that many people refuse to acknowledge.. …and that is going back to the 70s! I really don’t believe that any government was capable of the obvious advanced aeronautical technology I witnessed that night and I have yet to hear any government provide a reasonable explanation of what it was that I saw. No one will ever convince me that what I saw was not the definition of a UFO. There is a lot of information that you have no proper knowledge. you need first to check out Charles hall interview for 1hr 26mins on youtube about the tall whites. you can also check out on YouTube evidence of the tall White’s by David Hilton. I myself have my own information from 1991 . A very close friend of mine was in the sbs service during world war 2. He became friendly with USA army captain who he stayed in contact with after the war. His friend left the army and joined the cia . After 5 years he was given a high security clearance job with 20 agents under him. His job was looking after a tall white alien race with his agents. They have a base underground which is a 5000 square mile area North of creech airforce base. The Pentagon would arrange days out and his job was to secure the area where they visited and return then back safely. It may sound crazy but it’s the truth. There is so much more knowledge I have but would take pages to write. He died in 1987 and he never even told his wife. He only confided in his brother and Michael who was my friend who also died in 2006. If you are interested with more information feel free to email me. What I find is that many discount events that occurred long before the 1930’s. Mass UFO sightings and some crashes did happen in the late 1890’s as well. These were obviously not ours, unless you know of a country that had such technology during those times. In history, there are many records of “flying shields” or other obvious technology use that simply was not within their capability. While I don’t discount Hellyer’s motives and beliefs, I believe he only has a small part of the information to base his claims on. It goes much deeper and I cannot discount that it may even go beyond our own understandings. There have been too many witnesses that were directly involved (such as Philip Corso) in these events who have not only confirmed of the technology retrieved, but the aliens themselves that assist in Hellyer’s claims. While I have tried to find evidence against such claims in the past, I always come to the same conclusion. What many do not realize is that there are branded science fiction books that are written by many military and government personnel, but are actually based on considerable amounts of fact and often true events. Many of these were not involved in space programs or anything that would give them the idea of writing books about aliens and government cover-ups that they themselves were part of. Along with the many testimonies of those who can be confirmed to have worked in such agencies and have witnessed these alien beings themselves, I doubt they would create such lies for their own agendas as many of these testimonies come from them on their death beds where they can comfortably state the truth without fear. I tend to believe them as they really have nothing left to lose nor can the government do anything as they have done to other “whistle blowers” in the past. Why disclose such as the truth to damage their own reputations? Because they have held this secret, they believe the public needs to know, and their experiences appear to be genuine and while strange, isn’t the truth often stranger than fiction? The aliens came to the same conclusion as General Patton.. This information horrifies and terrifies me. All these images of deformed people, animals, etc. is anxiety producing, but I have the sick feeling it may all be too true. It makes the old end time scenario pale in comparison to mutants being turned loose, people being eaten and enslaved, and not one but several “alien races” vying for control of earth. And one alien race being superior to us with IQ’s of over 1200. How could a God that loves us unleash this on us? Yes, these Tall White Aliens exist and if you want to know more about them you should contact the author of Binoetics: First Touchdown who met them. He had spoken about them in his novel years back before even Paul Hellyer and Snowden came up with their stories. He refers to them as Esseliens and says they have been ruling, controlling and manipulating humanity since before the recorded history. He also says they are the ones who had orchestrated WWII and who helped Hitler and the Nazis accomplished their agenda. The coming of Hitler and the Nazis was prophesied in the Bible. Is the Bible a book of God? According to author, the Bible is not a book of God, but a book of these Esseliens our ancestors called Gods or angels. Binoetics really means a hybrid between a human being (woman) and an extraterrestrial race called Esselien. They secretly use these hybrids to accomplish their goals (agenda) here on earth. The grey aliens serve them and are used to watch over us humans. Examples of these hybrids are: Jesus Christ, Buddha, Alexander the Great, emperor Constantine, Nostradamus, Da Vinci and many more. http://www.Facebook.com/Binoetics. The auto biographical experiences of Airman Charles Hall in the Books “Millennial Hospitality”describe his interaction with “the tall whites” while stationed as a lone weather observer near what is now Creech AFB, NV. He was apparently not classified in his work, but was only required to be alone while performing his duties which again makes proof of his work unable to be verified. However, he comes across as above intelligence with a total recall that is worth reading and makes the UFO puzzle in an interesting perspective that has allowed “technology download” to be an important aspect of ongoing secret operations within government agencies. The books are an easy download from Amazon. My favorite is book 3. Regardless of Snowden, Assange and Wikileaks, UFOs do exist, I know this for an absolute fact as I have seen one with my own eyes so you’ll just have to take my word for it, or not, I don’t really care which as I know the truth and no one can take that away from me or ever change my mind about what I saw. UFOs are real.